In 1883 Monet moved from the north-west of Paris to Giverny where he lived until his death. Adjacent to his property was a small pond which he acquired in 1893, where Monet created a water garden with an arched bridge in the Japanese style. In 1900Monet exhibited a series of ten canvases of the pond, showing a single subject in differing light conditions. He worked on similar series representing poplars, haystacks and the facade of Rouen Cathedral during the same period. 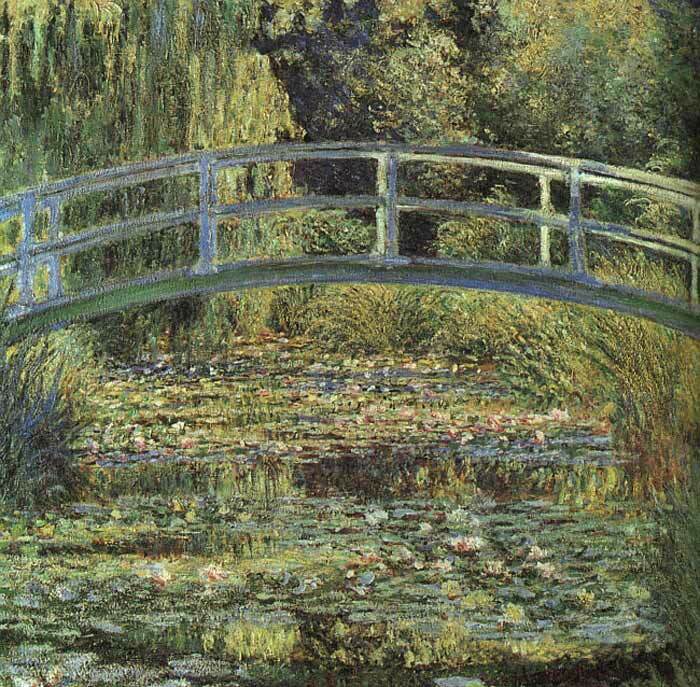 The simple design of this oil painting - The Waterlily Pond, with the close-up view of the bridge was repeated in several other canvases. The fresh greens of the foliage evoke an early summer's day. SPECIAL NOTE : The painter will make the reproduction as close to the original oil painting as possible. If you want your painting to alter from this likeness, please email us and " The Waterlily Pond, 1899 " will be reproduced according to your special requirements.